Ditties about love lost and gained, blue herons, Roman Roads - nothing seems to escape Steve Tilston�s muse. For thirty years he has been observing and penning, and rubbing shoulders with some of folk�s most respected and in the process he has garnered a loyal and knowing following. Born in Liverpool, raised in Birmingham, lived in Bristol, now in Yorkshire, Steve reflects an easy cosmopolitanism in his music. As an acoustic guitarist he has few equals. He worked as a graphic designer before switching to music in 1971 and took up residence in Bristol after an invitation to record for a fledgling folk label for whom he cut his first album An Acoustic Confusion. In 1972, now on Transatlantic, Steve released his second album Collection. During this decade, Tilston gained a growing reputation in the folk world, working with Fairport Convention amongst others, but it wasn�t until 1977 that he released his next album the self-financed Songs From The Dress Rehearsal. Steve became somewhat disillusioned with the club circuit at this time when folk performers had to battle with stand-up comedians, although in the early eighties he ran a folk club with Bert Jansch in London�s New Kings Road. For his next album, in 1983, he teamed up Maggie Boyle (In For A Penny - In For A Pound) which also included rock luminaries Pete Bardens, Peter van Hooke and Raf Ravenscroft. Steve�s sortie into the loud and electric was short-lived; in 1985 he performed with Ballet Rambert and became more interested in Irish folk music. Steve is one of those rare performers who can genuinely bring a tear to the eye; his slightly melancholy delivery, frequently touching content, and evocative imagery could move a brick. Steve Tilston�s 1987 album Life By Misadventure (on his own Run River label) was a return to form and ranks as one of his own favourites. Another album for Run River, featured Steve and guitarist John Renbourn, Tony Roberts and Maggie. As Ship Of Fools the foursome toured the States on two occasions. Steve�s interest in Irish music was reflected on the instrumental album he released in 1990 Swans At Coole which featured the extended composition �Rhapsody�. (This was included on the 2001 reissue of �Life By Misadventure�). 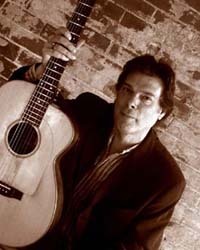 In the 1990�s Steve Tilston continued to perform live with his partner Maggie Boyle and they released the album Of Moor And Mesa in 1992 which achieved critical and cult acclaim in the States. This contained several Tilston classics, two of which turned up in the Fairport Convention set: �Slip Jigs And Reels� and �Naked Highwayman�. Rock �n Reel effused: "...a masterpiece - there's no other word for this. Steve Tilston is the finest songwriter England has ever produced. Here is his talent at its peak. He has absorbed the best of the ballad tradition into his writing, and the results are staggering ..."
On his own Hubris Records, the next solo album And So It Goes was released in 1995 whilst 1996�s All Under The Sun saw his first album alliance with multi-instrumentalist Maartin Alcock who featured in the late eighties Jethro Tull line-up. At the end of the millennium, Steve had split up with his partner Maggie Boyle and 1999�s Solourubato was another solo guitar/vocal album. Also that year, Steve joined with Waz! a trio featuring Allcock and Pete Zorn for their second album, Fully Chromatic. The deceptive simplicity of some songs hides the industry that lies within, as the tunesmith toils and hones every metre, every last cadenza, into truly a work of art. In 2003 Market Square Records released what might be Steve Tilston�s most accessible album to date, Such And Such. This CD is classic Steve Tilston but with support from Maart Allcock, Anna Ryder and the great Andy Sheppard on sax he has produced a very contemporary and decidedly commercial offering. In live performance, Tilston has a commanding and engaging presence and �Such And Such� may well engage a wider audience who are not necessarily drawn to folk music but will revel in the superb lyrical and musical craftsmanship. Tilston can pen a catchy tune, whilst the wordplay means that this is music that works on different levels from the cerebral to the simple. Steve is one of those rare performers who can genuinely bring a tear to the eye; his slightly melancholy delivery, frequently touching content, and evocative imagery could move a brick. The deceptive simplicity of some songs hides the industry that lies within, as the tunesmith toils and hones every metre, every last cadenza, into truly a work of art. Those wanting to catch up on former glories would do well to investigate the compilation The Greening Wind (Hubris, 1999) which features tracks from his earlier albums and 2001�s Live Hemistry which is an excellent document of Tilston�s live performance skills. Text © 2003 get ready to ROCK! All rights reserved.